The GainMaker® Node is designed to serve as the cornerstone of today’s emerging fiber deeper network architectures. The GainMaker Node combines the superior proven technologies of both the GainMaker RF Amplifier and Prisma® Optical components. Available with two or three high level RF output ports, it is the ideal platform for delivering video (digital and analog) as well as high-speed data services over advanced hybrid fiber/coax (HFC) networks. With its modular design of fiber receiver, reverse fiber transmitter and RF amplifier electronics, the GainMaker Node station can provide the full complement of functions required by advanced networks. The GainMaker Node accommodates a second forward receiver with an RF switch to accommodate forward path optical redundancy. Reverse traffic can be combined and routed to FP, DFB, or CWDM reverse transmitters. The High Gain Dual launch amplifier module provides two high-level outputs (with the ability to split one internally to feed a third port). Additionally, the GainMaker Node is available with an optional custom status monitoring transponder for use with Scientific-Atlanta’s ROSA / TNCS status monitoring and control element manager. On-board temperature, automatic gain control (AGC) levels, RF switch position, power supply condition, as well as other features/parameters can be monitored through this transponder. Installation of the GainMaker Node is quick and easy. The GainMaker Node can be ordered as a complete node or as an upgrade kit for existing GainMaker System amplifiers. 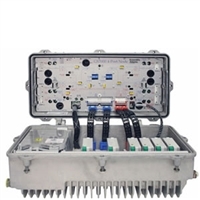 The fiber receiver is delivered with preconnectorized fiber terminations. The optional preconnectorized cable stub is the ideal method for connecting the GainMaker Node to the fiber network (see cable stubs data sheet). External termination connectors are also available for central strength member and LXE style fiber optic cables. The GainMaker Node includes a 4-fiber handling tray for these cables. System reliability and upgrade flexibility are integral to the construction of the GainMaker Node. Key features include a chromate plated housing to withstand harsher operating environments, local status monitoring of each module, and a 1 GHz housing for future higher bandwidth applications. 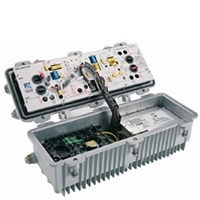 The Model GS7000 4-Port Node is Scientific-Atlanta’s latest generation 1 GHz optical node platform and utilizes a completely new housing designed for optimal heat dissipation. This platform allows independent segmentation and redundancy for both the forward and reverse paths in a reliable, cost-effective package. The forward path of the Model GS7000 Node can be deployed with a single broadcast 1310/1550 nm optical receiver distributing common services to either four output ports (all high level) or six output ports (two high level and four lower level). The forward path can also be segmented by using two independent optical receivers that each feed half of the node’s output ports (left/right segmentation). Forward path optical redundancy is supported via the use of optional redundant optical receivers. The type of forward path segmentation and/or redundancy is determined by the type of Forward Configuration Module installed in the node. The Model GS7000 Node’s reverse path is equally flexible. Reverse traffic can be segmented or combined and routed to a maximum of 4 FP, DFB, or CWDM reverse optical transmitters, or to advanced Baseband Digital Reverse optical transmitters as part of Scientific-Atlanta’s bdr™ system. Reverse path optical redundancy is supported via the use of optional redundant optical transmitters. The type of reverse path segmentation and/or redundancy is determined by the type of Reverse Configuration Module installed in the node. A Reverse Input Port is also provided for high frequency (5 - 210 MHz) reverse signal injection. All optical transmitters and optical receivers used in the GS7000 have new high profile module covers that include both a self-contained fiber pigtail storage area and an integrated pull ring for easier module installation and removal. Additionally, the GS7000 optical receiver is a new low-current design that dissipates less power and incorporates a two state interstage RF attenuator switch for performance optimization. The Model 6940 Collector/Terminator Node is a three port unbalanced node of the Prisma Model 6940 Node family, specially designed for the collector / terminator architecture. In the forward path, the high gain optical receiver in both the collector node and the terminator node accepts 1310 and 1550 nm wavelength optical inputs and provides forward RF output to the launch amplifier module. The launch amplifier has three unbalanced forward RF outputs, one of which has a 5 dB higher level than the other two. In the reverse path, the launch amplifier in both the collector node and the terminator node has three reverse RF inputs fed from the HFC plant. The three RF inputs to the terminator node are combined and amplified in the launch amplifier and routed to an RF output port. The RF output is routed to the collector node through an operator-installed, hard-line coaxial cable. The collector node combines this RF signal with its three reverse input signals. The combined reverse signals from both the terminator and collector node are amplified and routed to the collector node’s reverse transmitter for optical transmission to the headend or hubsite. The Model 6940 Collector/Terminator Node utilizes a standard Model 6940 Node housing. 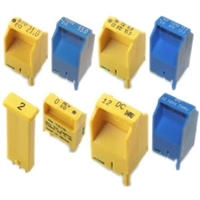 The housing incorporates many features that enhance ease of use and reliability, such as a separate AC powering port, optional redundant power supply, and extended ports to allow for easy heat shrink weather protection. The Model 6940 Collector/Terminator Node can also be configured with a Scientific-Atlanta status monitoring transponder. The transponder, in conjunction with Transmission Network Control System (TNCS), or other compatible element management system, enables remote monitoring of critical node related parameters, and remote control of each optional reverse path switch for ingress troubleshooting.